Our CTA crusher backing resin is used as a shock absorbing compound that prolongs the life of the cone crushing machines. Quarrying and mining industries worldwide use our product as a cost saving flexible backing of low viscosity that flows into small cavities behind the manganese steel plates. Also available with this product is our Crusher Backing Resin Release Agent. This is a wax based release agent which can be applied to the new mantle or hopper prior to pouring in the backing. This will allow the backing to be removed easily during the next service and manganese mantle change. 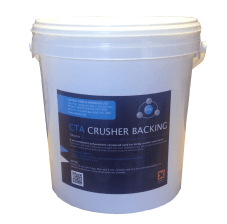 CTA Crusher backing resin compound is shipped globally and we now have a base in the USA! 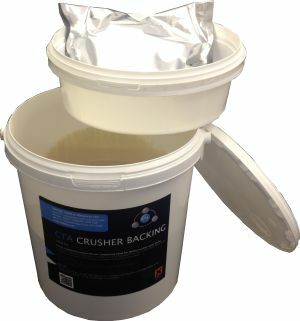 Why use CTA Crusher Backing Resin? Neatly packaged in a single tub with the activator self contained in a foil bag. To ensure ease of application and reductions in transportation we decided to encompass the activator within the main tub of backing. This has been made possible by filling the activator into a foil bag, rather than traditional metal or plastic containers. Also reducing wastage and disposal of secondary container. The above images show how we have made this possible. CTA are one of only a handful of suppliers who offer a NON-FLAMMABLE polyurethane as opposed to an epoxy resin. This results in reduced transportation costs for the customers and often a large reduction in paperwork and documentation required. Contact us now for bulk discount and more information on our Crusher backing resin compound for cone crushers.